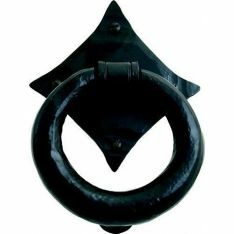 From the Anvil door knockers will give a touch of elegance to any front door. This range of handcrafted door knockers comes in a variety of styles and finishes perfect to fit various types of properties, from doctor’s door knockers, art deco door knockers, ring door knockers which are ideal for more modern buildings, to pear shaped door knockers, steel ring door knockers and Shakespeare door knockers which are perfect for historical period and grade listed homes. We also supply the popular lion’s head door knocker which can suit traditional and contemporary buildings. To further decorate your entrance door, we have available a selection of door numerals and letter plates. We also supply letter tidies to cover letter plates and escutcheons to cover door keyholes in order to give a neater appearance to doors. In case your front door doesn’t have a door handle or a cylinder pull, we would recommend our selection of stunning, yet functional centre door knobs. Security is highly important in any property. We also would recommend installing door chains to further equip your front door. Door peepholes should also be installed as these provide safety and security. To keep interior doors open we have available cabin door hooks, and to prevent scuff marks and holes on walls from opening doors too quickly or widely, we supply door stops. To protect the door itself from dents and scratches door kicking plates are perfect.